Manually create on my launcher folder accelerators, it creates accelerators, but when the softare was open, it open in the 'black space' cited before. Any extra information just ask, and plz say how to obtain. Something funny abou this bug, ni google, you can find, looking hard, a good number of example unsolved, but when joining the bug here in launchpad, clearly, the number is zero or very low. Have you installed libreoffice-filter-binfilter ? I've removed, purged, done everything possible in my profile, nothing seems change, I even done the icons 'manually' (copying the code from /usr/share/applications, and paste in gedit, and then save like LibreOffice *****.desktop) again... And when I did this, the icons are not more showed in launcher, when application is started with a bank new file, or activate by opening an already existent file. It's a complete mess... I don't know what to do anymore, I've searched in any bug related, in google, in forums, no one seem to have a solution to my problem. For quite a while now I've been having this issue with LibreOffice icons. Usually when I start Writer the generic LO icon appears (a white one with a grey corner) and stays even when opening a document. If I quit Writer then start it again with a document I get the correct type icon (e.g. the Writer icon for a .doc/.odt file) PLUS a blank space above it where an icon should be. RIght-clicking the space gives me <nothing>, Lock to Launcher or Quit. Locking then unlocking removes the blank space. This issue has been driving me nuts for some time. libreoffice-filter-binfilter isn't installed either. Unity 6.2, Ubuntu 12.10 x64. Now instead of blank space it sometimes shows 2 icons - an unknown icon and Calc icon under it . See attachment. 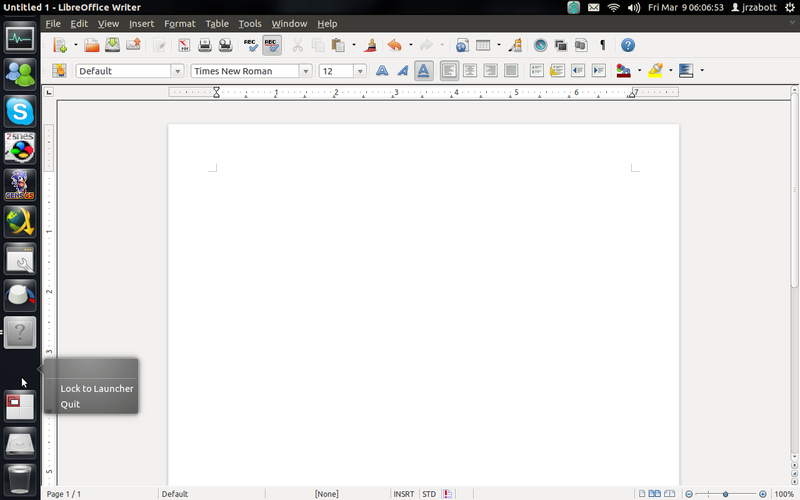 When I open a LibreOffice document, I get the the generic LO icon appears (a white one with a grey corner). But the LIbreOffice Icons are not active. And if I click on the generic icon, nothing happens-- it will not open the active LibreOffice document If I click on the LibreOffice Icons then a new untitled document opens, but the LIbreOffice icon still doesn't show itself active (the little white arrow to the left). If I click on Alt-Tab, the LibreOffice documents do not appear although they are open. HOwever, if I click Super+W, then the documents appear and I can access them. IN fact, that is the only way to access open LO document if I have shifted to a different window. Unity 6.4, Ubuntu 12.10 x64.